In Bangladesh, FOSS Bangladesh took their message to the street with large banners featuring the "Stop the Hollyweb" message. 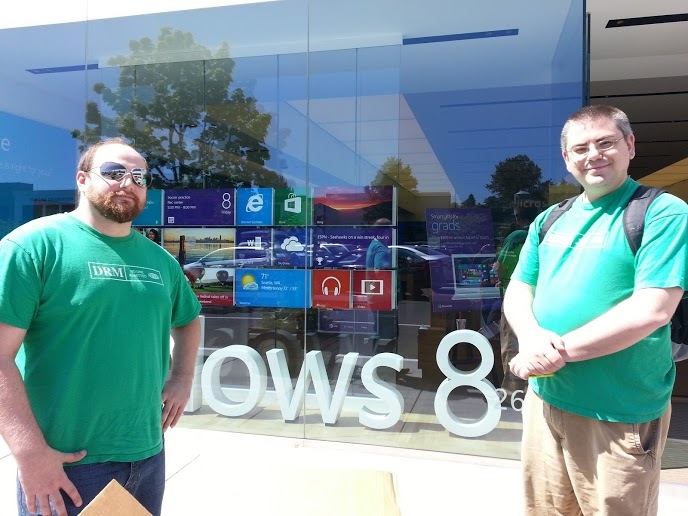 In Seattle, FSF staff and volunteers handed out information to shoppers at a clutch spot between both an Apple store and a Microsoft store until security forced them to leave, at which point they moved to the University of Washington campus to continue. In Boston, the Free Software Foundation delivered an "Oscar" and tens of thousands of signatures opposing DRM in HTML5 to the World Wide Web Consortium (W3C). Online, publishers like O'Reilly and No Starch Press offered discounts on DRM-free ebooks to honor the Day. International Day Against DRM 2014 will be held Tuesday, May 6th, 2014. To be notified of Day Against DRM events in your area, be sure to sign up for the announcement mailing list. International Day Against DRM is an important time to come together to show our strength, but the fight to eliminate DRM is year-round. That's why we're launching a new discussion list for volunteers who want to get more involved in the grassroots effort to eliminate DRM. The discussion list will be instrumental in organizing next year's Day Against DRM events, and will help the Defective by Design staff with ideas and on the ground support throughout the year. Sign up for the DRM Elimination Crew discussion list today.